Shares of Sonic Corporation (NASDAQ: SONC) were surging on Friday trading, ahead of the company’s third quarter financial results scheduled for Monday afternoon. According to Estimize, the restaurants chain operator is expected to deliver a record quarter, with historically high earnings of $0.37 per share. The Street is modeling consensus earnings of $0.37 per share on revenue of $163.36 million, while the crowd is projecting consensus earnings in line with experts’ projections, on slightly lower sales of $163.15 million. These estimates imply a 23 percent year-over-year increase in earnings, and a 7.3 percent surge in sales, as the company reported earnings of $0.30 per share on revenue of $152.2 million in the third quarter of 2014. In addition, Sonic has a history of meeting estimates. In a recent report, 24/7 Wall St. provided a list of the 10 least healthy fast-food restaurant chains in the U.S. The restaurants were evaluated using data from Nutritionix, a nutrition information database. Above Jack in the Box Inc. (NASDAQ: JACK) and Wendys Co (NASDAQ: WEN), in first place was none other than Sonic. 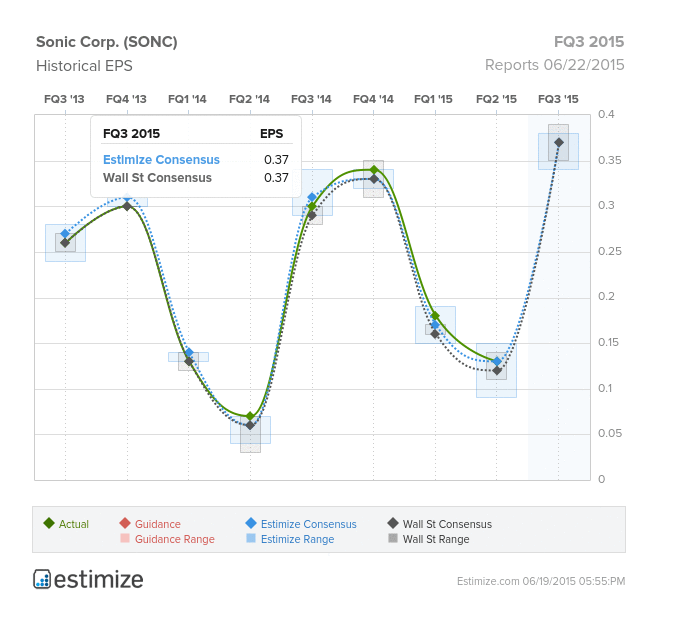 With almost half of the items in its menu containing at least 1 gram of saturated fat, and 10 of the hamburgers having more than 1,100 calories, Sonic is the most unhealthy fast-food chain in the U.S., according to 24/7 Wall St.
Qorvo Earnings: Can RF Micro Devices-TriQuint Merger Drive Strong Results?